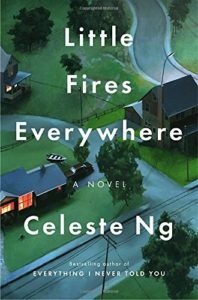 Little Fires Everywhere is the latest novel from Celeste Ng, who wrote the popular Everything I Never Told You (reviewed here) in 2014. Little Fires Everywhere takes place in idyllic Shaker Heights, OH, where Elena Richardson lives with her husband Bill and four kids, Tripp, Lexie, Moody and Izzy. The Richardsons are well off – they have a big house and their kids drive fancy cars, do lots of activities and apply to Ivy League schools. When the book opens, someone has set fire to the Richardson house, and everyone suspects Izzy. But why? Izzy’s anger at her mother – building for years – is stoked when Elena leases a small rental house the family owns to a mother and daughter, Mia and Pearl, who move to town with few belongings under a shroud of mystery. Elena is immediately suspicious of Mia, an artist who has lived her life on the move and who embraces none of the traditional trappings that Elena has always sought. Mia and Pearl’s lives become increasingly intertwined with the Richardsons’ when Mia starts cleaning their house and Pearl becomes close with three of the four siblings. Izzy, meanwhile, is drawn to Mia and becomes an apprentice of sorts to her, which drives a wedge even further between her and her mother. Ng is a good storyteller, letting the connections between the two families slowly grow deeper as the pages turn. There is a side plot involving the adoption of an abandoned Chinese baby by a white family, but while I expected that story to be more central to the novel, it wasn’t. Elena and Mia wind up on opposite sides of the controversy over the adoption, but the real story here is about the relationship between the two families. Little Fires Everywhere has been very well-received, but I have to admit that I didn’t love it. There were too many neat parallels involving motherhood and pregnancy for the story to remain plausible to me. Elena – a reporter – got access, often too conveniently, to information that she shouldn’t have known, and everything ultimately got resolved too abruptly and dramatically in the end. Some of the characters became more one-dimensional over time, particularly Elena, making them less sympathetic and the story less complex. So while I enjoyed the process of the story unfolding, I found in the end that it lacked substance. I didn’t take away much from the book. I listened to Little Fires Everywhere on audio. Jennifer Lim’s narration was precise and empathetic, though at times a little too upbeat for the subject matter. But she moved the story along nicely, and the hours went by quickly. I just wished the promise of the story had held up throughout the book. Posted on November 15, 2017 by gayle. This entry was posted in Audiobooks, Fiction and tagged audiobook, celeste ng, little fires everywhere. Bookmark the permalink.